Coronary Artery Disease (CAD) is the most common type of heart disease. When plaque builds up, it narrows the coronary arteries, decreasing blood flow to your heart. Eventually, this may cause chest pain or shortness of breath. 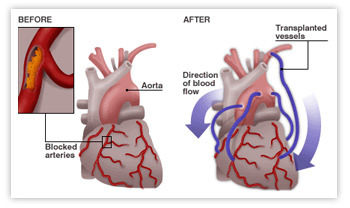 CABG, or bypass surgery, is the most common type of heart operation. This procedure is designed to treat atherosclerosis (blockages) of the coronary arteries, to eliminate symptoms (angina, chest pain, shortness of breath), prevent myocardial infarction (heart attack), and ultimately minimize the risk of dying from cardiac disease. The CABG operation is performed by dividing the sternum (breastbone). Then, a vein from the leg (saphenous vein), artery from the chest wall (internal mammary artery) and/or arm (radial artery) are sewn onto the coronary arteries downstream from the blockages. This effectively reroutes the flow of blood around the blockages to nourish the previously oxygen-deprived heart muscle. The terms single-bypass, double-bypass, triple-bypass, etc. refer to the total number of coronary arteries bypassed, and varies considerably from patient to patient. Our surgeons perform minimally invasive harvesting of the saphenous vein to facilitate leg healing. In addition, they utilize multiple arterial grafts as much as feasible to facilitate long-term patient outcomes. Off-pump CABG, or OPCAB, is a specific type of coronary bypass operation in which the heart-lung machine is not used and the heart continues to beat throughout the procedure. Specialized equipment is used to stabilize the heart motion during each bypass graft. There are select circumstances in which it is preferable to perform OPCAB surgery. Our surgeons are well trained in all OPCAB techniques and employ this approach whenever it benefits our patients. The recovery process varies for each individual. Your chest will be opened, needing time for your sternum to fuse back together and energy to return. You can expect to feel back to normal around 4-6 weeks. Your doctor will address your personal recommended activity level and post-operative care. Remember to listen to your body and take your recovery day by day; again, this is a different process for everyone. Be sure to follow up and attend your post-operative appointments after surgery. Like all surgeries, it is important that you do what you can to go into surgery as healthy as possible. Eating healthy, taking walks within your limits and making sure your body is as prepared as possible may help ensure a speedy recovery. Colorado Cardiovascular Surgical Associates, P.C. has served the people of the Denver metro area for more than 25 years. All of our surgeons are board certified in their area of specialty. We offer state-of-the-art surgical treatment options, comprehensive care, and 24-hour availability. Copyright © 2015 Colorado Cardiovascular Surgical Associates, P.C.